In the United States, it is estimated that approximately half of all first marriages will end in divorce. Divorce can negatively impact families, and it is becoming increasingly recognized that healthy marriages are critical to society given the associated physical, emotional, and financial benefits for families. According to a study conducted in the early 1990’s, the North American Muslim divorce rate is estimated to be at 31%. As divorce becomes more prevalent among American Muslims, it is increasingly important for families to understand how to minimize the risk of divorce and build a foundation for healthy marriage. Marriage is a cherished bond. Although divorce is permitted in Islam, it is considered a last option. Couples are encouraged to be proactive in establishing and maintaining a healthy and strong relationship, and to explore all possible remedies before pursuing divorce. Prevention and intervention approaches are necessary tools that can help couples achieve satisfying, stable, and long-lasting successful marriages. Focused on teaching couples relationship skills, these approaches fall into two main types of activities: 1. Marriage Education programs, and 2. Counseling Interventions. 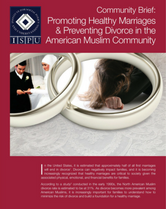 This study identifies the marriage education and counseling intervention needs of American Muslims as the result of an extensive literature review, consultation with a team of experts, and in-depth interviews with 33 individuals from the American Muslim community in Michigan. The 33 individuals were from four key groups (six imams, seven counselors, ten divorced individuals and ten married individuals) across various ethnic groups and educational and economic backgrounds. Insert your information to download the community brief.